Best way to get from NYC to LA? BMW M5! You may not know this but the best way to get from NYC to LA is in a 2000 BMW M5 (thats the E39 type for you petrol heads). It’s also a pretty fast way to get there. 31 hours 4 minutes to be exact. You didn’t read that wrong. Alex Roy and David Maher broke the previous transcontinental record of 32 hours 7 minutes just over 6 years ago. When most people think of Columbus day they think of the Atlantic voyage to the new land. When Alex Roy thinks of Columbus day I’m sure he thinks of his voyage. So what would make someone want to do this? Well to answer that you’ll need to read his book. 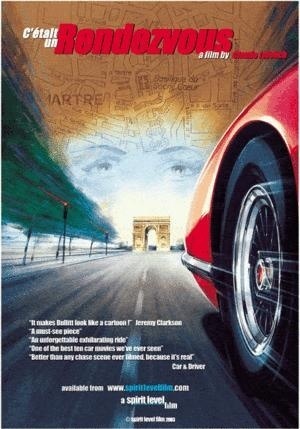 C’était un Rendezvous is a fantastic short video shot in Paris in 1976. If you haven’t seen it you have to! Here’s the youtube link. This is a video that words can’t fully explain its magic. It was shot with a Mercedes Benz 450SEL 6.9, for those of you who don’t know thats a luxury sedan. “But I hear a Ferrari 275 3.3L V12 engine!” What good ears you have there. Yes you are correct. The sound was dubbed over. The result is nothing less than magical. So why do I bring it up? Well Alex Roy talks about it in the book (you did order it right?) and he tried one of his own…. In New York City. Still waiting on the video from that trial run..
Update: Youtube took down the original video, all I can find is this copy with sinnerman dubbed over it. So your wife has taken out a 5 million dollar insurance policy on you, you have a co pilot and you’ve spent hundreds of hours playing video games and months plaining the route in Google Earth. Now what? Well now you need a car. Not just any car fits the build though. You need something fast. You need something reliable (if all else fails make sure you know German). You need something that gets good gas mileage and you need something with enough space to put all of your toys in. The logical choice is clearly the BMW M5. 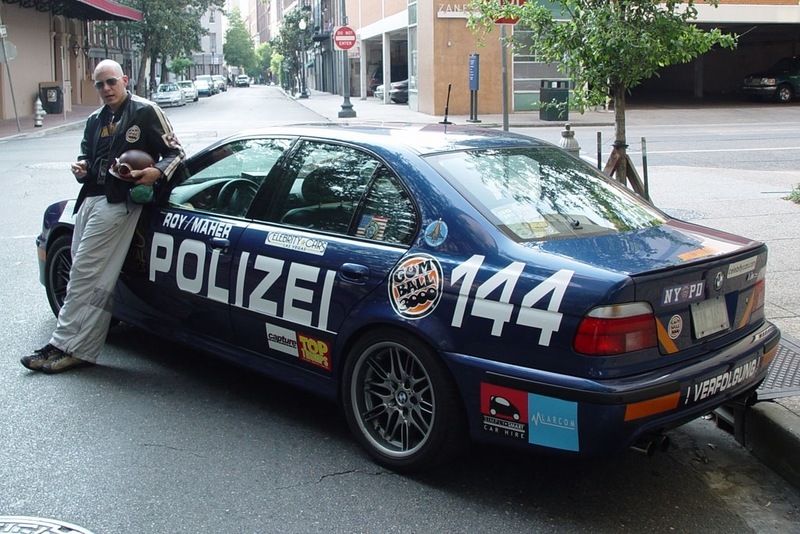 A car that is fast enough for your insanity yet without the Polizei 144 stickers is pretty covert. A car that without the massive antennas on the trunk, without the night vision camera, without the half dozen GPS units, without the laser jammers, without the military binoculars, without the radio scanners and CB radios, without the covert police lights, without the 20 gallon racing fuel cell in the trunk may seem normal… Driving down the highway at 160 mph. Normal? Well, close enough. But who am I kidding? This car is no where near normal. There is a beauty to that fact. I feel as though if I drove this car 5 feet I would get arrested for breaking a dozen local and federal laws. (Although Alex that doesn’t mean I wouldn’t drive it if you gave me the chance! I promise to keep it under 160mph) This is a car that is great for going across the country… whether that be in North America or Europe. What do you get when you bring a bunch of super cars and wealthy people with money to burn together? You get Gumball! An event that brings together people that enjoy driving fast and partying. 3000 miles in 7 days. I would love to participate in Gumball 3000. So I did what anyone would do. I went on their website, headed to the FAQs and scrolled down to “how much does it cost”… My heart sank. £30,000. Thats almost $50,000. Yeah I don’t think I’ll be able to participate anytime soon. My guess is you won’t be able to either. Fear not. Youtube has your back. Thank you Alex. Not only did you break a record you are allowing many people to live vicariously through your trips. This entry was posted in Rants, Travel, Watch This! 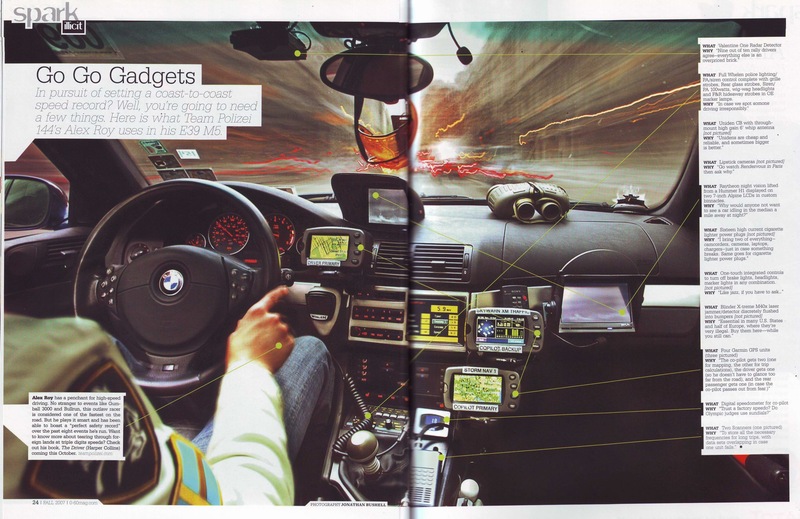 and tagged 160 mph, 31 Hours 4 Minutes, Alex Roy, BMW, Cannonball, Cannonball Run, David Maher, E39, Ferrari, Gumball, Gumball 3000, Illegal, Los Angeles, M5, Mercedes Benz, New York City, Petrol Heads, Picks, Polizei 144, Racing, Rendezvous, The Driver, Watch This, Youtube by MartinJMS. Bookmark the permalink.